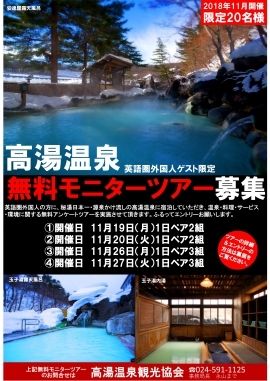 Takayu Hot Spring Tourism Association is holding a free tour of the hot springs for foreign residents from English-speaking countries. After spending a night in Takayu Onsen, you will fill out a survey and then share your photos of the tour on your social media accounts. Please apply in pairs and one person must be able to understand Japanese because the tour will be held in Japanese. -Breakfast and dinner will be provided. -2 people will be sharing one room. -They will be able to pick you up and drop you off from Fukushima Station.